Recently opened cliff. The cliff is still being worked on, so it has many routes still to be cleaned and some still not liked to be released. Access: You reach Casto. Continuing to the hamlet of Alone, along the road after about 700m you reach a parking lot of the Park entrance. 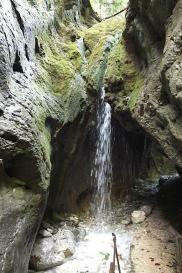 2) Grotta del Drago Sector - can be reached by walking for 300 meters.